There is no information on the Red Cloud Mine website indicating who owns or runs the business. The Red Cloud Mine website domain (“redcloudmine.com”) was registered on June 3rd 2016. We have been in business since 2011 but officially we started in full pace since 2014. 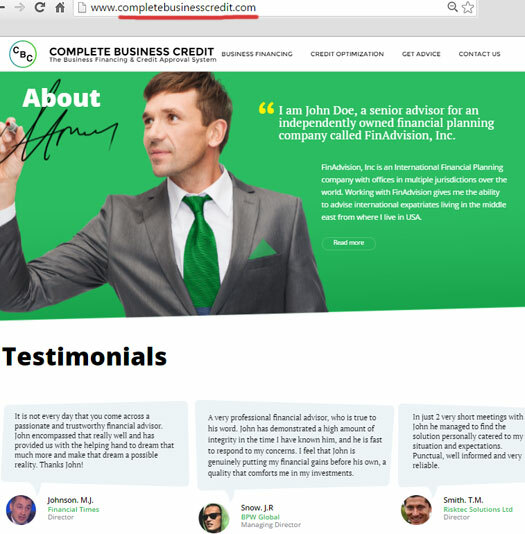 Of note is the “about us” section of the template design has been left as “John Doe”. 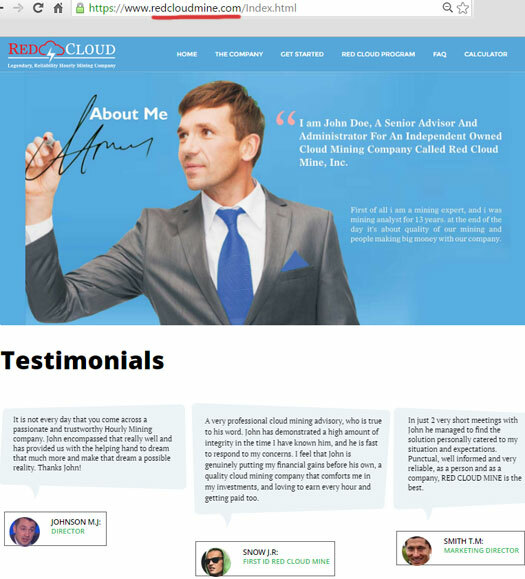 I am John Doe, a senior advisor and administrator for an independent owned cloud mining company called Red Cloud Mine, Inc.
First of all I am a mining expert and I was a mining analyst for 13 years. The 13 year mining claim it totally bogus, with decentralized cryptocurrencies only surfacing in 2009 (7 years ago). Photos used to represent businessmen on the Red Cloud Mine website are stock photos belonging to Minerva Studio. A “corporate address” on the Red Cloud Mine website is actually that of Lundin Mining. Lundin Mining appears to be a legitimate mining company, with precious metal mining operations around the world. As far as I can tell it doesn’t have anything to do with Red Cloud Mine. As far as the company itself goes, everything on the Red Cloud Mine website appears to be made up. Red Cloud Mine has no retailable products or services, with affiliates only able to market Red Cloud Mine affiliate membership itself. Red Cloud Mine affiliates invest 0.1 to 50 BTC or more on the promise of a 3% a day ROI for 60 days (180%). Referral commissions in Red Cloud Mine are paid out via a unilevel compensation structure. Referral commissions are paid out as a percentage of funds invested by affiliates in a unilevel team. Every Red Cloud Mine affiliate who recruits ten affiliates who invest at least 5 BTC, earns a share in 2% of funds invested in Red Cloud Mine. Although not explicitly clarified in the Red Cloud Mine compensation plan, it is believed the Team Builder Pool is paid out monthly. Affiliate membership with Red Cloud Mine is tied to a minimum investment of 0.1 BTC. Your first tipoff that not all is what it seems is the completely bogus Red Cloud Mine website. All of the information about the company, its operations and management is completely made up. Your next tipoff is the compensation plan. A 180% ROI in 60 days, irrespective of bitcoin price fluctuations and mining difficulty? Quite obviously Red Cloud Mine are using newly invested funds to pay off existing investors, making it a Ponzi scheme. There’s no proof on the Red Cloud Mine tying a 180% ROI to bitcoin mining. And even if there was, it’d probably just be unintelligible jargon copy and pasted from some other website. As with all Ponzi schemes, once invested funds run out Red Cloud Mine will find itself unable to meet its ROI obligations. At that point the scheme collapses, with the majority of investors losing money. Due to the Red Cloud Mine’s use of bitcoin, the chance of recovering victim funds will be slim to none.